Founded in 2010, DOXA is an international research collective based in London, UK. Through an on-going project called ‘Creative Space’, DOXA facilitates cross-disciplinary dialogue through open discussion events in order to approach new visions of culture in light of the current economic crisis, globalization and the digital turn. Through various events, DOXA brings together artists, academics, policy makers and industry professionals who explore new ways of developing and sustaining culture and creativity while addressing current developments in policy, society and the economy. Doxa (δ?ξα) is a common belief, as opposed to knowledge; doxa is associated with community, dialogue and truth. It has been one year since DOXA first began organizing events as a research collective, three years since the 2008 global economic crisis and ten years since 9/11. September 11th 2001 in many ways foreshadowed the events of 2008, where for the first time in a generation the fragility of modern Western capitalism became visible on a mass scale. 2008 marked a year where the financial economy reached a tipping point in which the contradictory effects of capitalist accumulation became a visible reality. The situation in the UK has become particularly dire. The recession resulted in the election of a new Conservative – Liberal Democratic government, which has made massive cuts to the public sector, including 30 percent cuts to the Arts Council England and a 300 percent increase in university tuition fees. These cuts were accompanied by rising inflation, growing unemployment, and an increase in freelance contractual work and internships as full-time employment opportunities dried up. Young people are now graduating with fewer job prospects, and when employment is found, there is little job security or access to long-term social benefits such as health insurance and pensions. The growing severity of the situation has since sparked student protests and occupations, most notably at Slade, Middlesex and Goldsmiths Universities beginning in November 2010. 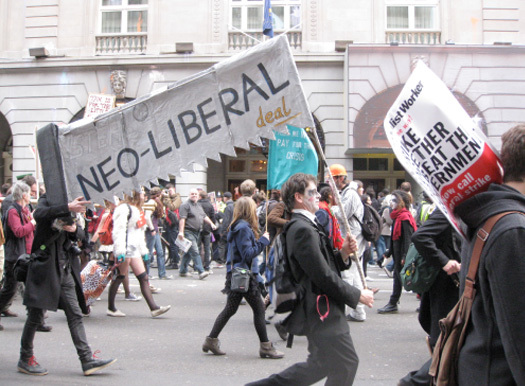 A number of worker demonstrations have taken place, culminating on the 26th of March 2011 where a quarter of a million trade union and public sector workers from across the UK converged on the streets of London. Despite the numbers, the demonstrations remained largely ineffective in instigating change. Persisting issues of unemployment and social inequality inevitably manifest in riots following the shooting of Mark Duggan – a 29-year-old man suspected of carrying illegal firearms – by police in the area of Tottenham in North London in August 2011. The lack of explanation for his death by the police led to growing discontent and racial tensions between authorities and a largely ethnic community, mirroring the spark of the Brixton Riots in the 80s. The event revealed a loss in confidence in government and authority, and provided the opportunity for nights of lawless looting and arson, largely by groups of disenchanted youth. The riots in the UK followed a series of youth and worker uprisings in Greece, Spain, France and the Netherlands as many European countries confront similar issues of shrinking public resources, youth unemployment and debt. Similar movements have since growing globally with the spread of Occupy Wall Street initiatives in cities around the world. The fallout from the 2008 economic crisis has been particularly problematic for those sectors of the economy associated with the arts and culture. In a “creative economy”’ in which creative communities and local cultures are touted as new engine of economic growth, creative workers have increasingly struggled to make a living in urban centres that offer little and precarious remuneration. It is in this context that notions of the commons have becomes especially important for understanding the contradictions inherent in today’s cultural economy. The commons, as explained by academic and activist Stevphen Shukaitus, is “the way in which individuals relate to each other in relation to a shared resource,” whereas enclosures are understood as the limitations placed on the commons that creates scarcity and produces social relations that lead to the common’s depletion. The commons is a practice of sharing where there is less emphasis on individual gain for the sake of the collective, and where a community addresses how they are to live in common. To be in common is “an active process that is always emerging” in a mode of being and working together for the greater good of the community. In a creative economy, the commons offers a model of practice that does not benefit the few at the expense of many, but rather allows for greater contribution and equality in a world that is shared. Over the past year, DOXA has been organizing events that create a space for dialogue concerning the shape of the current cultural economy in order to find new models for developing and understanding culture today. In the UK, the crisis is a crisis of creativity in the creative economy. 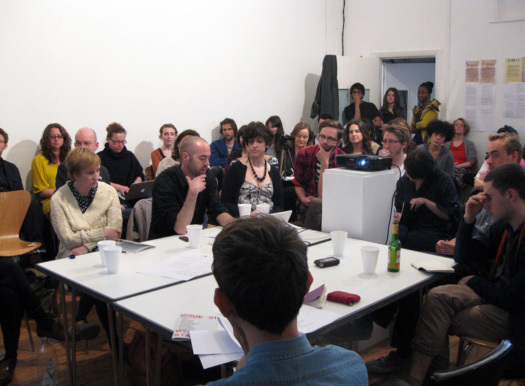 Through some of the events organized by DOXA, we sought to form a constructive response to the crisis of the creative economy by pooling knowledge and resources amongst artists, academics and practitioners that generate alternatives models for constructing a creative economy other than those that have been adopted by neoliberal governments in the UK and abroad. 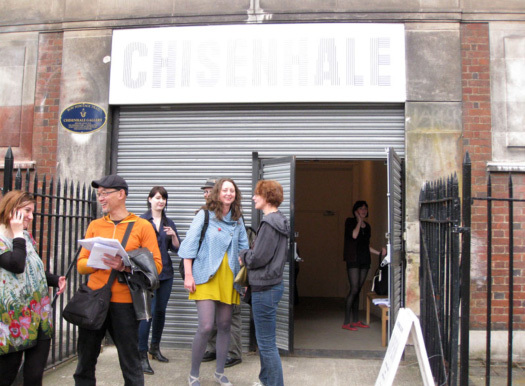 An economy of the commons is founded through practice – through experimentation, collective dialogue and critical research, which has formed the basis for organizing an event called AMASS (meaning to collect or gather, and share knowledge and resources) in April 2011 at Chisenhale Gallery in London. The event was a collaboration between DOXA and two other groups: the Amateurist Network (http://amateuristnetwork.wordpress.com/), a learning and support network that organizes discussions around modes of self-organization and precarious labour, and Ment (http://journalment.org), an online journal for contemporary culture, art and politics. The event brought together over 60 participants from a community of practitioners, researchers, students and artists to discuss experiences and challenges in the practice of the commons, and to address concerns in the current climate in the cultural sector. The research remains open and perpetually nascent as we experiment with forms of organization as a means of developing research through practice. Through the sharing of knowledge we sought to also create the commons in practice, and propose another way of living and working together through the discussion of concrete examples and case studies. It was a means of pooling knowledge on practices of the commons to find new ways of working together in the current economic climate. The following is a summary of several case studies that came out of the event and which offer emerging practices that provide hope for the realization of the commons today. Eva Weinmayr, co-director from AND Publishing who was invited to speak by the Amateurist Network, discussed examples of self-organized practices in a way that opened up opportunities for the commons. Self-organization is a model of collective working, which allows a community to organize itself around a specific project or resource, which in this case was the running of the Byram Shaw Library. The library was forced to close after losing financial support from the college after the relocation of the school to King’s Cross in London. In an effort to resist losing an important resource, people came together and decided to operate the library collectively, thereby keeping this important public resource accessible. As a result of its transition to a self-organized project, the space no longer functioned as a traditional library but became more of a community centre for talks, reading groups, exhibitions and workshops. While this collaborative and community-led collective effort offers one example of the how a commons might be organized, the self-organization of the Byram Shaw Library was loosely organized, suffered from frequently changing membership, and as a result was short-lived. As the organizers discovered, it is difficult to sustain vibrancy in a space that is unregulated, temporary and run on a voluntary basis. Notions of self-organization and community-led volunteerism have recently been a centerpiece of David Cameron’s “Big Society” initiative, wherein the community is asked to offer what often amount to band-aid solution for the cuts on public spending and the lack of jobs. The language of ‘participation’ is central to Cameron’s Big Society project and is understood as a mechanism for the society to take care of itself, to generate economic value or growth without government support. Such uses of a language of popular participation used by neoliberal governments and institutions must be consistently reflected upon by collectives attempting to recuperate these discourses. As explained by Rene Gabri of New York based collective 16 Beaver, “We need to be open to antagonism, we need to reject traditional forms of ‘collective practice’ or social cooperation that are only disguised versions of exploitation. We need to also resist and be concerned about how our activities may be recouped into reinforcing the structure or processes we are trying to undermine … [we need to] distinguish what is sold to us as cooperation by corporations, institutions and even universities from a kind of cooperation that would begin to actually unsettle our politics, our lives” (Gabri 129). In order to resist the inculcation of such discourses, the library collective undertook a number of events that underscored the common character of its self-organization. One of which, called ‘The Piracy Project,’ involved building up a collection of books through requests from the community, wherein books were sourced, photocopied and contributed to the library. This event also involved a series of talks and workshops around ideas of authorship, originality, open source production and copyright. The piracy project borders on illegality by infringing on copyright to defend access to knowledge, learning and a shared resource. They write: “This project is not about stealing or forgery, it is about creating a platform to innovatively explore the spectrum of copying, re-editing, translating, paraphrasing, imitating, re-organizing, manipulating of already existing works. Here creativity and originality sit not in the borrowed material itself, but in the way it is handled.” The project supports the idea of free culture and knowledge sharing for the greater good of a community and offers practices of the commons that values the freedom of knowledge beyond economic concerns. A mandate to provide sustainable development within the communities in which they operate. A cooperative demonstrates that a commons can be based both spontaneous and informal self-organized practices as well as in formal organizational structures. While the cooperative is only one such model, it offers an interesting and productive alternative to top-down hierarchical forms of business. It is a model that values not only its own labourers, but also other businesses within a wider economy, and thereby recognizes that the commons is not only as a practice amongst individuals within a single organization but involves relationships with other organizations within a broader economic ecosystem. Public Work Group (www.publicworksgroup.net) is a group of architects based in East London interested in the construction of space and networks and how individuals and groups identify and invent the commons within these spaces. In their International Village Shop project, they proposed a model of working that is both individual and collective. In the project, Public Work Group created a network of shops in regions around Europe that source their products locally and build trade links across rural communities. The project therefore facilitated an exchange of localized practices of trade and production across borders and amongst isolated communities, while creating new networks of traders in which each member had an individual interest in both learning from each other and in contributing as a part of a wider community of producers. 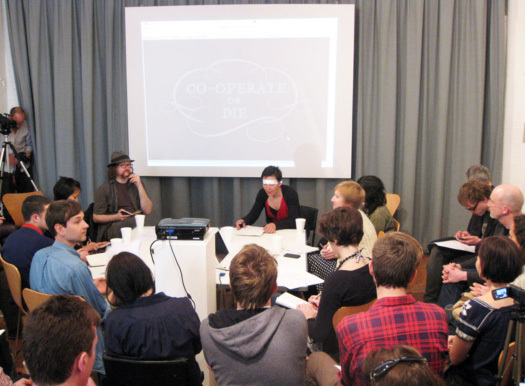 If the Byram Shaw Library and Calverts cooperative offered models of individuals coming together for a shared project or business, Public Work Group was based on practices of the commons amongst producers and organizations in a wider community and thereby created a commons on a much larger scale. As demonstrated by The Publics Works Group, the commons can also be considered as an ethics of giving and contributing within everyday life and in organizational practice. The notion of the gift economy emerged as a major theme throughout AMASS, and was perhaps best illustrated by a project called Mutant Space (http://www.mutantspace.ie/). Mutant Space is an arts network and an online skills sharing platform that provides artists with support for their projects and events through a gift economy. Skills are donated to a bank as services that can be requested by anyone in the community. Services can equally be accessed and requested from others on the platform. Drawing on the work of Marcel Mauss, Yuk Hui (co-founder of DOXA) describes the gift economy as an economy founded upon trust, which contrasts with a barter system that is based on simultaneous exchange. An exchange-based system produces relations that rely on a notion of value based on scarcity, in which one experiences a lack in ‘not having’ as the basis for trade. This in turn implies a notion of personal property wherein the incentive of giving is the immediate expectation of receiving. The gift economy on the other hand, is based upon giving without an immediate or even symmetrical expectation of reciprocity. Following this model is the online platform AAAAARG.org, for example, which allows users to request books that are then uploaded and made available by someone in the community as a PDF for download. AAAAARG.org is a platform for the discussion and sharing of knowledge and learning that is not unlike the Piracy Project. Started by Sean Dockray in L.A., Mutant Space has grown from 3,000 to 50,000 users and offers over 10,000 texts. 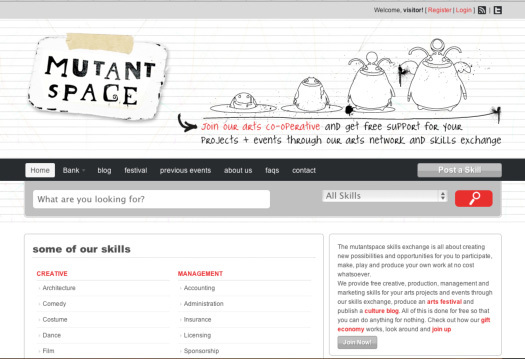 Both Mutant Space and AAAAARG.org offer examples of online-based projects that apply the new possibilities of web platforms and social networks for building and sustaining forms of collective knowledge and skills. These case studies begin to provide blueprints for how the commons might be formed in actual practice. They are projects that can be applied in a wide array of contexts, organization and social situation. In the current economic climate, the commons faces continual challenges posed by the enclosures of knowledges through forms of intellectual property restrictions. By building a network of individuals and organizations with shared values for the commons, and who practice these through “doing” and being together, these kinds of projects offer new and unexpected social relations that might form the basis of collective life in the commons. Altena, Arie and Lucas van der Velden. “A new Dark Age for Dutch Culture.” Amsterdam: Sonic Acts, 2011. Web. Bishop, Claire. “Con-Demmed to the Bleakest of Futures: Report from the UK.” E-Flux, no. 22, January, 2011. Web. Gabri, Rene. “Postscript from Rene.” Taking Matters into Common Hands. Ed. Lind, Maria and Lars Nilsson. London: Blackdog Publishing, 2007. Print. Kimberly A. Zeuli and Rober Cropp. Cooperatives: Principles and Practices in the 21st Century. Madison: University of Wisconsin. Web. For an overview of the situation in the UK, see Claire Bishop’s in a recent article in e-flux journal. Bishop, Claire. “Con-Demmed to the Bleakest of Futures: Report from the UK”: www.e- flux.com/journal/view/209. More details on the actions against the cuts to education can be found on various blogs and websites from the various university occupation campaigns. See: Save Middlesex Philosophy, Online: http://savemdxphil.com/, Slade Occupations, Online: http://sladeoccupation.wordpress.com/, and Save Goldsmiths, Online: http://savegoldsmiths.tumblr.com/. For coverage on the protests in Greece, see: “Greece protest against austerity package turns violent”, London: BBC News, 28 June 2011. Online: http://www.bbc.co.uk/news/world-europe-13935400. 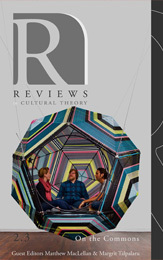 For sonic coverage of the protests in Spain, see: Madrid: “The soundscape of the revolution?”, Mediateletipos, 2011. Online: http://www.mediateletipos.net/archives/15881. France takes influence from the protests in Spain which are documented in blogs across the web. See: “Galvanised by Spain, France takes to the streets”, @Acampadaparis, 2011. Online: http://storyful.com/stories/1000003889. See more on the cuts to culture in the Netherlands in an article describing the demands of a letter to the State Secretary for Culture. Altena, Arie and Lucas van der Velden. “A new Dark Age for Dutch Culture”, Amsterdam: Sonic Acts, 2011. Online: http://www.sonicacts.com/A_new_Dark_Age_for_Dutch_Culture.html.